Using The Ansoff Matrix to identify growth opportunities What is the Ansoff Matrix? This model is essential for strategic marketing planning where it can be applied to look at opportunities to grow revenue for a business through developing new products ….. 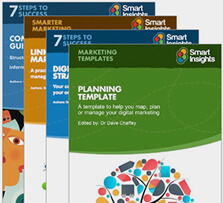 Reviewing how to integrate digital marketing into marketing team structures as part of Digital Transformation The latest Smart Insights research study shows how common Digital Transformation projects or programme are today with 30% already having a programme up & running and …..
What is the 7Ps Marketing Mix and how should it be used? The marketing mix is a familiar marketing strategy tool, which as you will probably know, was traditionally limited to the core 4Ps of Product, Price, Place and Promotion. ….. Examples of using the BCG Matrix (Growth Market Share Matrix) to review your product portfolio What is the BCG Matrix? The Boston Consulting group’s product portfolio matrix (BCG matrix) is designed to help with long-term strategic planning, to help a …..
Make sure you avoid these classic campaign planning mistakes We’ve all seen it. The #fail where a company that’s big enough to know better, completely messes up. The odd thing is that this continues to happen and I guess until …..
Use the honeycomb model to help inform your social media strategy Back in 2011, a group of professors from Canada; Jan Kietzmann, Kristopher Hermkens and Ian McCarthy created the Honeycomb Model to review social media effectiveness, looking at reasons why …..
Semantic Web, Knowledge Graphs, Social Media and Memes As a PhD student, I’m keen to discover the latest academic research, which often happens at conferences. Although my main area of research is within marketing, my specialist area is social media. This …..